Mike Gayle is one of my favourite authors- I love that he writes novels with feeling from a male perspective. It’s not that he’s trying to express the male perspective as some kind of “how to talk to men” way but more that he’s writing realistic scenarios and pulls out things that run around the male’s thought process without making a big deal out of it being” emotional”. Perhaps I’m not making any sense? Regardless, I tend to get a lot out of his novels and have been looking forward to each new one for years. 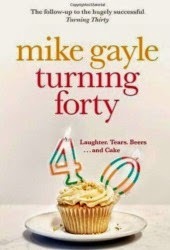 Turning Forty is a continuation of Gayle’s novel Turning Thirty with main character Matt Beckford- who has just split up with his wife and is approaching his fortieth. He’s being a bit of a baby about the whole forty “thing” and seems to have reached a turning point in every aspect of his life. Instead of making a plan to sort himself out he spends most of the novel going around in circles and getting himself into heaps of trouble. While doing so though he manages to make some friends, make us laugh and continue the strong bond he has already established with his family. I was frequently frustrated with Matt (as were his parents) and more than once wanted kick him up the backside- however it’s one of the things that makes him so endearing- the fact that he keeps making a mess of things. I love that Mike Gayle continues to portray men with solid relationships with friends and family. It gives humanity to his novels and creates relatable male characters for female readers. Matt Beckford does eventually seem to figure out what he wants and I didn’t actually find the outcome of Turning Forty to be predictable. I did sort of wish though that all the pieces of his life had fallen magically into place- they didn’t- which I suppose is true to life! Looking forward to hearing how Matt does in another novel in the future- maybe we won’t have to wait so long and it can be titled Turning Forty-Five?